Will My Child Be Charged As An Adult? The Arizona Criminal Justice system, as in every state, distinguishes between the consequences offered for juvenile offenders and those imposed on adults. In general, the consequences for those who face charges in adult court are dramatically more severe. For instance, in juvenile court, the judge always retains discretion to customize the consequences for each juvenile in their court, regardless of the circumstances. Judges may impose a wide array of consequences, ranging from apology letters and essays to intensive treatment programs and incarceration. Judges presiding over adult cases, on the other hand, are significantly constrained in what consequences are available. For most first-time felony offenses, a judge may offer probation, including community service and treatment. For any felony offense beyond the first and those involving drug sales and dangerous acts, a judge’s MUST send the offender to prison after a trial loss. Their only discretion lies in picking the length of the prison sentence sometime between the minimum and maximum prescribed by the legislature. Beyond the results imposed by the Court, adult felons are also marked with a conviction that can have permanent and catastrophic effects on their ability to pursue certain careers, get housing, or exercise certain constitutional rights (but see options for clearing a criminal record in Arizona). These consequences are not true of those found delinquent in juvenile court, whose records can be sealed when the child turns 18 and exits the juvenile court system (there are some caveats when the offense is of a sexual nature). There is more than age, however, that goes into the decision whether to charge someone as a juvenile or adult. Many times a juvenile may be charged as an adult if the offense they are accused of is particularly serious. The same is true if the juvenile has been in the court system a long time and continues to re-offend. Where the juvenile system has been ineffective at curbing delinquent behavior, the prosecution may opt to file in adult court, where the child then becomes subject to the sobering and harsh consequences of adult criminal court. A particularly troubling, but the all-too-common reason for filing in adult court, however, is that the time at which charges are pursued simply happens to be too close to the child’s 18th birthday. In these common situations, it may be perfectly appropriate that the matter is handled in juvenile court, but there isn’t enough time to apply resources of the juvenile system to rehabilitate the child. Regardless of how serious the crime, or whether it’s first or fifth offense when a minor is charged as an adult, they face the same mandatory penalties their adult counterparts do. For this reason, a recent law proposed by the Arizona legislature has huge ramifications for minors who commit delinquent acts. Both the Arizona House of Representatives and State Senate have passed HB2356 in April 2018. If signed by the Governor, this bill would allow Juvenile Courts to retain jurisdictions over a juvenile case until the juvenile’s 19th birthday. Should this law pass, the juvenile court would be able to extend efforts to help those whose minds are not fully developed prove their ability to learn from their mistakes without a permanent mark on their record that usually does more harm than good. As of the time of this writing, the bill is sitting on the Governor’s desk. It’s about time. 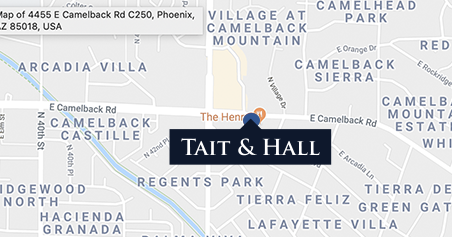 If you have questions about your child in the court system, don’t hesitate to call Tait & Hall for a free consultation at (480) 405-6767.